Top-of-foot pain is common among runners in Manhattan. And symptoms from pain on top of the foot can put you out of commission for weeks. Seek foot pain treatment from one of the top sports medicine and injury pain clinics in New York City so you can stay on your game. Don’t put off diabetic foot pain treatment, treatment for foot pain due to injuries or foot heel pain treatment if you suspect you have pulled tendons — your feet are too important to your lifestyle. Come to our pain management clinic to get your pain evaluation and treatment. Meet our pain doctor Febin Melepura M.D. to get the pain relief you need in the safe, reassuring hands of the best NYC pain management doctor. Arthritis is a common cause of foot pain, but the pain can be treated. Diabetic foot pain treatment provides relief for the disease that leads to top-of-foot pain and throbbing, sometimes unbearable, discomfort. Ankle injuries and accidents that lead to pain on top of the foot are surprisingly common. Your Midtown Manhattan sports medicine clinic can relieve your pain and get you back to your favorite sport. Your feet are complex structures made up of ligaments, tendons, muscles and bones that serve you, providing functional mobility and flexibility. Yet they’re so vulnerable to damage. Protect your feet as much as possible, but don’t hesitate to seek medical help if they start hurting. When there’s something wrong with your feet, you may feel burning sensations and pain on top of the foot. If the sensitive nerves running to your extremities are compromised, such as in the case of peripheral neuropathy, you end up with top-of-foot pain. 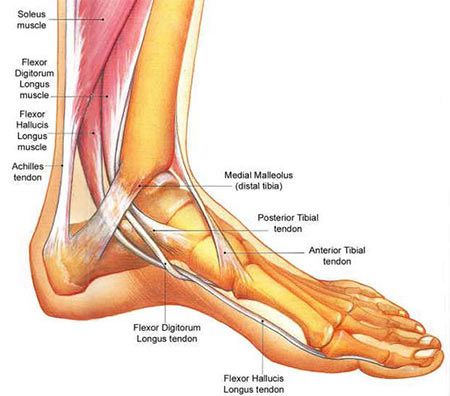 Or you may need foot heel pain treatment if you have a torn or tender Achilles tendon. Without sufficient foot pain treatment, even mild foot discomfort can be disabling. Rarely is foot pain just an irritation. Instead, because of the many potential causes of foot pain and because your feet are so vital to your continued mobility, get a thorough examination from an experienced NYC sports medicine doctor familiar with the many causes of foot pain. Type 2 and type 1 diabetes can lead to damage in your feet by affecting the blood vessels and nerves. The two most common types of conditions that require diabetic foot pain treatment are peripheral vascular disease (PVD) and peripheral artery disease (PAD). Untreated, PAD and PVD can lead to severe infection and gangrene that could eventually lead to the need for amputation of your foot. Top-of-foot pain typically is due to overuse. When you extend your foot for long periods of times, like years spent running or speed walking, your feet may rebel with top of the foot pain telling you to take a break or stop all together. While you’ll certainly encounter top-of-foot pain if something heavy is dropped on your foot, it’s also easy to overextend the tendons there. Playing a sport like football, where you may twist your foot as you fall, also can result in pain on top of the foot symptoms. Mild tendonitis often can be relieved by home remedies such as ice, rest and elevation, while foot pain treatment for athletes in NYC may require surgery, casts and physical therapy. Treatment for foot pain in the back of your foot may require repairing tendons if you’ve a ruptured Achilles tendon. Otherwise, rest, activity modification and shoe inserts may be enough of a foot heel pain treatment. To prevent injury, wear proper shoes for your activities. Do you have any questions about the foot pain treatment we offer in NYC? Would you like to schedule an appointment with the best rated foot pain management doctor Febin Melepura MD of pain management clinic in NYC ? Please contact our office for consultation with the pain relief specialist in Midtown Manhattan.